According to archaeological findings the area around the river Guadalquivir where Sevilla is located today was first settled by the Tartessians in the 9th century b.c. The Tribes who settled down in Sevilla where principally hunters and fishermen. Today people can find instruments in bronze from this period in the archaeological museum of Sevilla. In about 550 b.c. the whole Southern coast line and great parts of Andalucia were conquered by the Carthaginians. The Carthaginians also reached Sevilla where they made smaller settlements. In 216 b.c. the Punic war between the Carthaginians and the Romans destroyed the small town of Sevilla. It was not until 10 years later in 206 b.c that the Romans finally defeated the Carthaginians. The Romans settled down all over Andalucia and also just outside Sevilla in the town they named Itlica. The remains of Italica can still be found about 10 km from Sevilla. Italica was rapidly expanded and among the many remarkable constructions can be named an Amphitheatre, with a seating capacity of about 25,000 people. In Itlica can still be found examples of great Roman architecture like the three houses De Exedra, Los Pjaros or Hylas with impressive mosaics. The town was also the birthplace of two Roman emperors Trajan and Hadrian. In 49 b.c. the name of the town was changed to Hispalis by Julius Caesar as it became an official colony of the Roman empire. The town was constantly expanded and reached the area where Sevilla is located today. By the end of the Roman Empire Hispalis was one of the most important cities of Rome and the center of Christian activity in the Iberian Peninsula. In the beginning of the 4th century Andalucia and Sevilla was regularly invaded by different tribes. The Roman Empire started to fall all over Spain but not until the beginning of the 5th century they lost the final control to the Visigoths. The Visigoth period in Sevilla was a tranquil period in the history of the town apart from minor internal confrontations between different Christian factions. The Visigoth dominants in Sevilla lasted until 712 when the Moors reached the town after having invaded the Iberian Peninsula in 711. The Roman name, Hispalis, was changed to the Arabic name Isbilya. A great number of different Arab clans settled down in the town of Sevilla. This mixture of clans led to many internal conflicts during the first 200-300 years of the Moorish dominants. In 844, during the reign of Abd-Al-Rahman II (822-852), the town was invaded by Normans and had to seek help from troops from Cordoba (The Moorish capital of Spain). Apart from the internal conflicts many Moorish buildings were constructed in this period like the principal Mosque, which today is occupied by the Baroque parish church of Divino Salvador. After the fall of the Caliphate of Crdoba in 1035 smaller independent kingdoms arose all over Andalucia. This was also an important period for the Abbadid dynasty in Sevilla, which achieved important territorial extension and gained supremacy over other smaller kingdoms. In 1091 an intent to expand the Moorish area to Castilla ended with internal conflicts and with the Almoravids taking over the control of Sevilla. The Almoravids were very unpopular among the population due to their religious intolerance and in 1145 the Almohads from Cdiz took over the control. During this period, Seville was made administrative capital of Al-Andalus and constructions like the Buhaira palace and a bridge crossing the Guadalquivir are from this period. After the re-conquest of Sevilla, the city became capital of the kingdom of Fernando III. The king installed himself in the city and stayed there until his death in 1252. He was buried in the royal Chapel where visitors still today can find his impressive silver coffer. The next important event in the history of Sevilla was the great earthquake in 1356, which happened during Pedro I's reign. Due to the power of the earthquake many buildings were thrown down or severely damaged. Under the reconstruction of the city the parish churches San Miguel, Omnium Sanctorum, Santa Marina and San Romn were constructed. In the years after the re-conquest Sevilla saw a great influx of Jewish immigrants who settled down in the city. The Jewish colony grew fast and became the second largest in Spain after that of Toledo. The Jewish settlements also had its influence in the appearance of the city and today you can still find remains of typical Jewish architecture in the Barrio de Santa Cruz and in San Bartolom. In 1401 the construction of the Cathedral of Santa Mara de la Sede was initiated. The goal was to build the largest church in world and to some extent they succeeded as the Cathedral of Sevilla is the largest Gothic church in the world and third largest church. The construction lasted for more 100 years and was finished in 1507. In the end of the 15th century the Sevillian population supported Ferdinand and Isabelle in the war against the Nasrid Kingdom of Granada, which ended with Spanish victory in 1492. This year also marked the discovery of America and the beginning of the golden age of Sevilla. 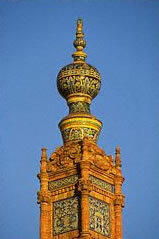 Sevilla became the gateway to the new world and one of the greatest capitals of Europe. The trade and the gold coming in from the world helped finance the expansion of Sevilla and important constructions like the University of Sevilla, the Royal Prison, the Courts of Law and the Monastery of San Francisco were initiated. In the next 3 centuries Sevilla benefited from the gold coming in from the new continent and the town was continuously expanded. In the 18th century Spain (leaded by Bourbons and Habsburgs Kings) was involved in many different wars. The heavy cost of these wars started to weaken the Spanish economy. Later Napoleon entered Spanish territory. The French invasion only lasted 4 years from 1808 to 1812 and didn't have an important influence in Sevilla. The 19th century was a period with growing political and economical instability throughout Spain and in Sevilla. This instability resulted in that Spain started to lose many of its colonies. At the end of the 19th and in the beginning of the 20th century the economic crisis had its hold all over Spain. In 1929 Sevilla arranged its first important international event in later history - the Iberian-American Exposition. For this big event several recent historic buildings were constructed, including the Plaza de Espaa and the Parque Maria Luisa. Throughout the 30's Spain was dominated by political instability, which culminated with the Spanish civil war from 1936-39. The result of the civil war was that dictator General Franco took over the power of Spain and stayed in control to his dead in 1975. In 1978 after the dead of Franco the political transition to a Parliamentary monarchy was started and the king Juan Carlos I was established as king. Today Sevilla, apart from being a tourist attraction, is also a modern metropolitan city and economical, industrial and governmental center of the Southern part of Spain called Andalucia. In 1992 and in 1999 Sevilla once again showed its ability to arrange important international events with first the Expo 92 and later with the world championship in athletics in 99. The successful exhibition of the above events has made the city a serious candidate for the 2012 Olympic Games.